We are a congregation of the Church of Scotland (you can find out more about the Church of Scotland HERE). The Cathedral is a 13th Century Parish Church set in the heart of the Royal Burgh of Dornoch, seeking to serve the wider community in which it lies along with its sister churches. The parish extends out from Dornoch to Embo, along Loch Fleet, staying on the south side of the Loch as the road crosses the A9, up past Little Torboll to Loch Buidhe down via Sleastary to the sawmill at Ospisdale and then on down to the Dornoch Firth - following the Firth along on the northern side until it reaches Dornoch again. We offer regular services on Sundays and other special occasions. Morning services are at 11am and we hold evening Songs of Praise mid-May to mid-September at 7pm. Communion is celebrated on the third Sundays of February, June and November as well as on Easter Sunday evening. A list of organisations and their contacts is available covering everything from Toddler's groups, through to the Guild. Information on weddings is also available. 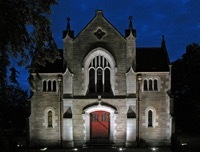 Thank you for the interest in Dornoch Cathedral that has brought you to this page. Let me introduce you to a little of the life of the congregation. We meet at least once a week for worship on a Sunday, but we also enjoy gathering at other times under many guises. Lunch Clubs to young people’s organisations, to the Guild and a Bakery project as well as a gathering for adults with learning difficulties, all help to shape our weekly activities as we seek to serve the community and the world beyond. Right now, things are a little different as I am ‘seconded’ for a year to the role of Moderator of the General Assembly of the Church of Scotland. 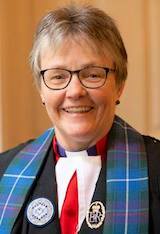 This means I am not available in the parish, but the Presbytery has appointed Rev Mary Stobo (email MStobo@churchofscotland.org.uk) as our Interim Moderator. From my years working with them, I know the congregation is a very resilient, hard-working, imaginative bunch and they will come, with Mary’s help, to the fore in the coming months to help with worship, pastoral visiting and all the practical matters that need dealing with. If you would like to add to that pool of skills and resources, then please contact us! We are also very privileged to have four ‘Revs’ to lead and inspire us in worship. As well as Mary, Rev. John Chambers, Rev. Dr. Alex Thomson and the Very Rev. Dr Alan Mcdonald will be sharing preaching responsibilities. I trust the variety of voices will be wonderfully refreshing. Throughout the year, as your minister, I would very much appreciate your prayers and I promise, that Dornoch Cathedral and its congregation, community and parish, will be very much in mine. We’ve managed to raise £460,000 towards the urgent refurbishment of this building, which forms a treasured part of Dornoch’s cultural heritage and social life. Now we need to find another £150,000 to complete the project. Any donation - however small (or large!) - will be gratefully received and warmly acknowledged.